Low cost. Good efect. Can result in some neat synergies with rest of rush lineup. Makes crowley better. So far most powerfull one ? Ow, immunity for rush. Imagine this with Boomship or in Dr. Boom mech warrior. What a way to push Rush Archetype that far. Good one, quite cheap too. Does anyone see Odd Rush Warrior being a thing? Seems pretty strong. I know this will be a good arena card. As for constructed - normally warriors would prefer the 1/3 armour gaining mech, but this is still very powerful. Your Darius Crowley won't be damaged and he will get a free kill and a free buff. I think this might be the card, which will define tempo warrior rush decks in general. In the past, when you played a rush minion, it traded off with the opponent's one. It was a 1:1 trade off, which didn't sound that impressive. The spirit will allow your rush minions to make more trades and you won't fall behind on the board. This is a nice inclusion in those tempo decks, I hope I am right on this part. It will be nice to see more variety from this class. Rush minions are just the ones with the keyword or this card would work with Boomship and Dr Boom? Dafuq? This is awesome spirit card. Does it synergise with Dr. Boom? This could actually be insanely strong. I predict this pushing Warrior towards the top of the meta given the large amount of rush minions they can summon. It will create big swing turns and leave opponents with a dilemma - kill the spirit or kill the mechs/Crowley? Either way it puts the Warrior immediately on top and on the offensive. Pushing the mediocre rush mechanic with everything they have. Please forget all the things about Dr. Boom, Mad Genius or The Boomship: If the wording is correct, it only affects minions that have Rush, not minions that gained Rush by any effect that gave them Rush. Only minions with Rush (not minions that gained rush) are affected! 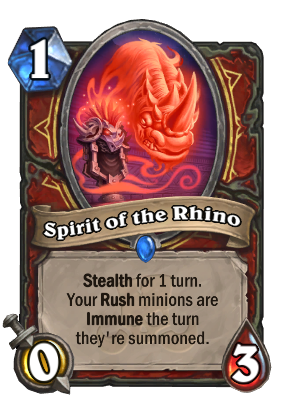 This needs just 1 more good cheap rush minion other than Rabid Worgen to be good, and based on the fact that we’ve seen no Warrior Rush minions so far other than Akali seems to suggest that one of the remaining Warrior cards is a Rush minion. Holy moly this looks strong! So glad I held onto that copy of Darius Crowley now. This card is extremely powerful. Completely turns the early game in favor of Warrior. Rush Warrior may turn into a pretty consistent Tempo deck.